More than two hours had passed since Shlomi had entered the public library, but Shlomi had no inkling of the time. He was caught up in a world of pirates attempting to capture Columbus, and steal the ancient gold coins which Columbus was bringing back to Spain, in order to rescue the king. Shlomi looked up, to see that the library was almost empty. Columbus was in the middle of facing off with the pirates, though, so Shlomi returned his focus to the words in front of him, for just a minute, so he could find out what would happen next. One minute turned into two. Shlomi closed the book, and gave a deep sigh of relief. It had been a close call, but Columbus was safe. Shlomi walked away from the reading area, and looked for the book cart. It was then that he noticed something odd. The library was entirely empty. He looked at his watch. It was an hour past closing time. How had that happened? Shlomi made his way over to the exit, and turned the door knob. The door he tried was locked. So was the other door. Shlomi surveyed the room and ascertained that there was, in fact, no way out. His parents had no idea where he was, because, despite their explicit instructions to the contrary, he had neglected to tell them where he was going. Shlomi banged on the door, hoping that someone would hear him, but it was useless. There was no one outside to help him. Shlomi walked over to the librarian’s desk, and picked the phone receiver. He punched in his home number, but it seemed that he needed to enter some kind of code, for the call to go through. Shlomi scanned the room again looking, hoping, for some way out. Then he saw it. It was some kind of ornamental rock, which was sitting on one of the tables. As unpleasant as it was, Shlomi came to the conclusion that he really had no choice. He picked up the rock, and heaved it in the direction of one of the windows. After a few attempts, Shlomi managed to crack the glass. Shlomi gingerly removed the broken pieces from the window frame, hoisted himself over the ledge, and ran home. A few days later, a letter arrived in Shlomi’s parents’ mailbox. It was a notice from the library, requesting payment for the damage which Shlomi had caused. Was Shlomi permitted to break the window? Is he required to pay for the damage he caused, or is the librarian at fault, for not checking sufficiently to see if there was a child left in the library, before locking the door? The same would hold true in our case, if the librarian had locked the library, without checking to see if there were any library patrons still inside. In such a situation, a person trapped inside would be permitted to break the window, and would be absolved from paying for the damage caused. However, in our case, the librarian notified everyone in the library that she was about to lock up the library, and Shlomi heard her announcement. Also, Shlomi was sitting in a far corner of the library, where he was not easily visible. Therefore, it is Shomi’s fault that he was locked in the library. Despite this, however, it was permissible for him to break the window. 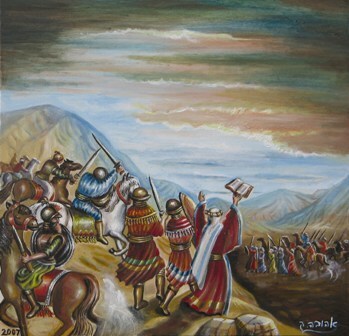 This is because of one of the laws instituted by Joshua, when the Jews first came to the land of Israel. Joshua stated that if a person is lost in a vineyard, and is unable to make his way out of the thicket, he is permitted to break branches, in order to get out. (Bava Kama 81b) However, because Shlomi’s situation was the result of his own negligence, he is obligated to pay. In Summary: Because Shlomi was at fault in getting locked into the library, he is obligated to pay for the broken window. Nonetheless, he was permitted to break the window, in order to get out of the library.